Ultimate Epsoak Epsom Salt Bundle | San Francisco Salt Co.
Sleep Formula - Premium Epsom Salt (Magnesium Sulfate) infused with Lavender essential oil. Sleep Formula is an all-natural remedy to soothe tired and aching muscles while promoting a deeper, better night’s sleep. It’s the perfect bath soak/foot soak for relaxing at the end of a long day. 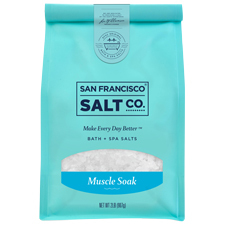 Muscle Soak - Premium Epsom Salt (Magnesium Sulfate) infused with Eucalyptus and Peppermint essential oils. Muscle Soak is an all-natural remedy to soothe tired and aching muscles, speed muscle recovery and help reduce injuries. It’s the perfect bath soak/foot soak for athletes and those with physically demanding jobs. 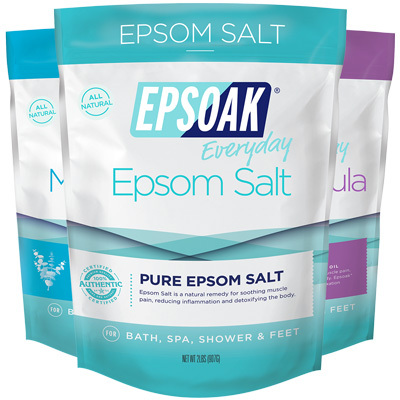 Original Unscented - Known for its premium quality and many therapeutic uses, Epsoak Epsom Salt dissolves easily in warm water to help soothe muscle pain, relieve aching feet, cleanse pores, and detoxify the skin. Epsoak is a naturally translucent/white salt in medium grain (0.2-3mm). 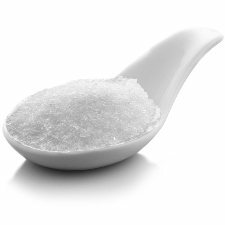 BATH & SPA - Add two cups of Muscle Soak Epsoak Epsom Salt to a warm, running bath. Settle in and soak for 20 minutes to help relieve stress and stiffness. SHOWER - Exfoliate and soften skin in the shower by mixing a handful of Muscle Soak Epsoak Epsom Salt with a tablespoon of shower gel or olive oil and massage onto wet skin. Rinse thoroughly. FOOT SOAK - Mix one cup of Muscle Soak Epsoak Epsom Salt with warm water in a foot bath and soak feet for 10 minutes minimum to help soothe aches and soften rough skin.